This entry was posted in General, General Science and tagged geography, maths, science, sunrise. Bookmark the permalink. Ha, I had sometimes wondered if the summer days were longer. Nice one. Hey, I was just grateful you did all the hard work for me. I got to read it, have my question answered, skim over the bits that made my brain hurt and look at the nice diagram. What more can you want from a blog? So is there a point in mid September and mid March when you have equal length days? That’s correct Bunty 🙂 The September and March equinoxes. Very interesting…..and one more thing that occasionally occupies my vacant mind; here in the Australian tropics after the winter solstice it takes an awfully long time for the sun to get it’s arse into forward gear and substantially increase daylight hours. 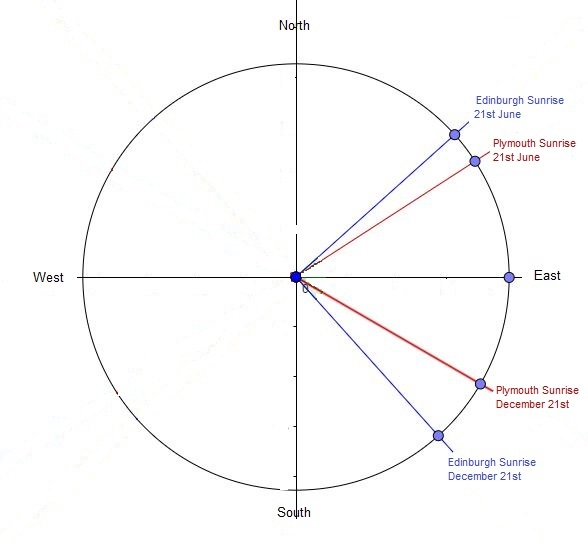 During the first few weeks after 22 June daylight increases only a matter of seconds each day until September when the sun really gets a wriggle on and illuminates more minutes each day. The universe is a wonderful place. I have no idea as to why this maybe the case, possibly earths wobble? Yep, I get it and have always wanted to go far north in summer to experience a long day! I’ve been amazed that even up here in Glenrothes, there is a notable difference Gilly, compared to the length of summer days in Penzance 🙂 Mind you, it also works the other way in winter, the days (well daylight) are even shorter up here. I confess I’ve never thought about it in this particular way. But I enjoyed reading about it and I’ve had a crazy thought or two in my long life. 🙂 I think it interesting to look at a map (Do people still look at maps???) and see what countries are on the same longitude/latitude, then think about their climate, etc. Thanks Janet 🙂 I must do a follow up post about the difference in angles up to the sun at mid day for each corresponding place, it still amazes me as to how low the sun is up here this time of the year!